Everywhere you look there is another natural disaster. Could your family survive for the typical three days it takes for help to arrive after a disaster? It’s time to pack the supplies for Simple 72 hour kits for each family member. Let’s keep it simple and geared to each person’s specific needs! 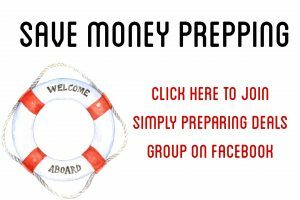 We’ll help you find the BEST prices on your simple 72 hour kit gear on our new Simply Preparing Deals Group! Pack items that are unique to your family’s needs. Consider your individual circumstances, environment and situation. You will most likely be carrying this kit, so the items you can pack that will serve double duty, the better. 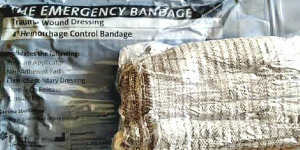 This emergency kit is intended to keep you alive for 3-5 days, not for prolonged periods of time. Pro Tip: Individual kids’ 72 hour kits should reflect their ages and what they are able to carry. You’ll need to carry the rest. Do you have an infant? Don’t forget formula, diapers, wipes, etc. A family member with special needs? What equipment will they need to make it through a period of emergency? Each kit needs a three-day supply of food and water, per person, remembering you may not have access to food and water. Do any of your family members have special dietary needs? Picky eaters? You’ll want to choose foods that meet their needs. *Hot Chocolate or other water flavorings. I like the *this post contains affiliate links freeze dried meals that require you to only add hot water to the bag for them to be ready to eat. They are lightweight, and easy to pack. If you choose to go with the freeze dried meals, you’ll need to make sure you have the water for them, as well as the ability to boil that water. Make sure everyone has a light weight mess kit, along with at least one pot to boil water in. Perhaps your family would enjoy a mix of the above to complete their 72 hour menus? Don’t forget to add a few comfort foods too! Set up a 6 month schedule where you rotate out the old stuff in your simple 72 hour kits with shorter expiration dates, and add new stuff back in. 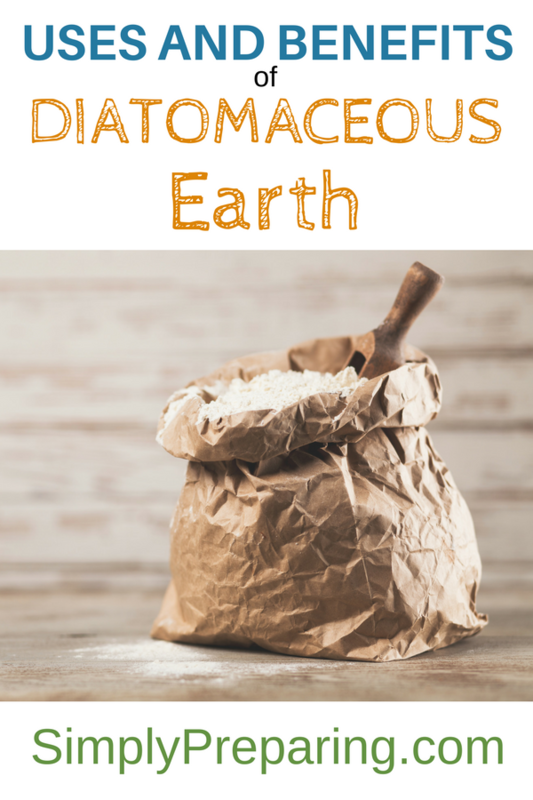 PRO TIP: To cut down on the cost of freeze dried meals, purchase them by the bucket, and ration the contents of that bucket between your 72 Hour Emergency Kits. Each person needs their own canteen, collapsible water container or a couple of water bottles. Your family will need a way to filter or obtain more water. You can choose a personal water filter like the Life Straw or Life Straw Family Water Filter to meet this need. In addition, I like to add a few Datrex Emergency Water Packets to my bag. Remember, 1 gallon of water per day is needed just for drinking. You’ll want to make sure you store a few larger containers of water where you store your 72 Hour Emergency Kits or Bug Out Bags. The 7 Gallon Aqua-Tainer is an excellent choice. 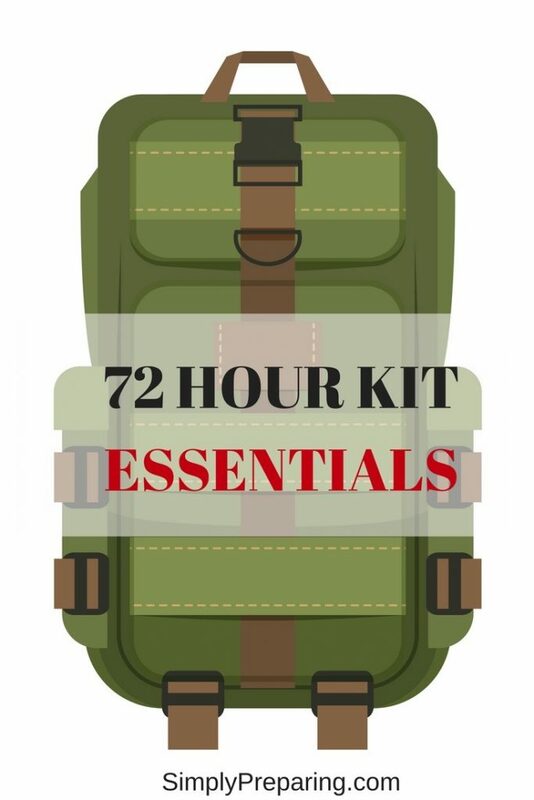 Pro Tip: Not sure what you need in a backpack to use for a simple 72 hour kit? 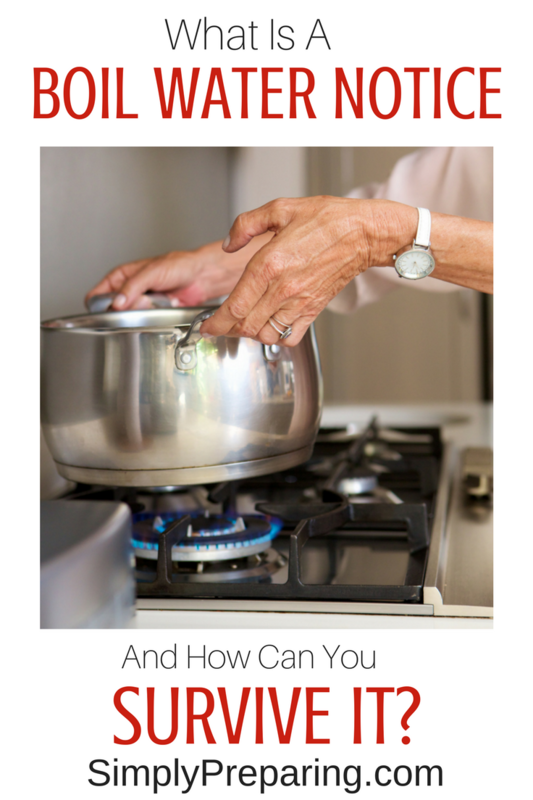 You can learn about that by reading our post discussing what you should look for. Remember! You don’t have to pick your back pack before you’ve decided on what to put in it. You can absolutely gather what you need FIRST, and then choose the pack that best fits your stuff. Heck, you may not even choose a backpack. I chose a tool chest on wheels for my medically complex son’s needs! *Warm Coat, Cap, Gloves depending on the weather. Change out clothing every six months! *Undergarments, unless going commando is your thing. *Wool Hiking, Socks because dry, warm feet are essential. *Battery Powered Flashlights, Lamps, etc. *Solar Powered Lightening Flashlights, Lamps, etc. I highly suggest the Luci Inflatable Solar Lights. *Cell phone charging blocks like the Mophie Powerstation Plus. *Can Opener These military can openers work great, are light weight and don’t take up space. *Face Masks We love the ReadiMask, A Full Face Respirator that could save your life. You can learn about other face mask options in our post about Choosing the Best Emergency Face Masks. Pro Tip: Take all the items marked ‘1 per family and put them into their own container to grab as you grab your individual kits. I also keep a case of 50 year canned water by my 72 hour kits for my medically complex son. Pro Tip: Date every single item that could expire. Mark you calendar for six months out, and rotate any expired items. Inspect individual 72 hour kits twice a year. Seriously, the last thing you want to do during an emergency is keep anxious kids (and adults) busy. Make sure you add some activities to their simple 72 kits to help make the hours pass quicker. *Whatever relaxes you and can get your mind off the worry. Whew. 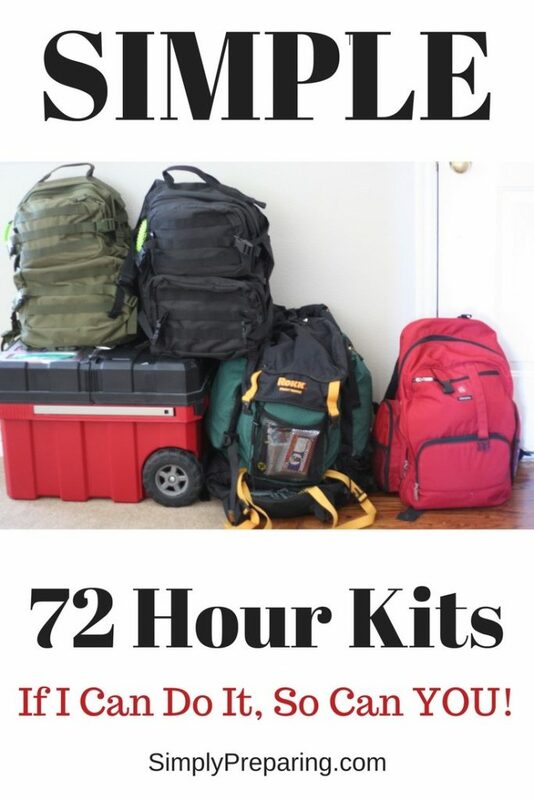 You’ve got your simple 72 hour kits packed for each family member. Way to go! Next we’ll get to work on Family Emergency Kits. These kits are meant to build on the base of your individual 72 hour kits to see your family through a longer term emergency.